I’ve written before about how easy it is to overlook how innovative and creative previous generations of knitters were. Putting it like that I’m sure many of us would say, ‘oh no, not at all’, but then we come across something that reveals, in our surprise, exactly that. Today I want to share a pattern from a book that sparked my interest for exactly this reason. This is an American pattern book by Clarks O.N.T and J & P Coats for which the copyright (dated 1943) was held by The Spool Cotton Company. 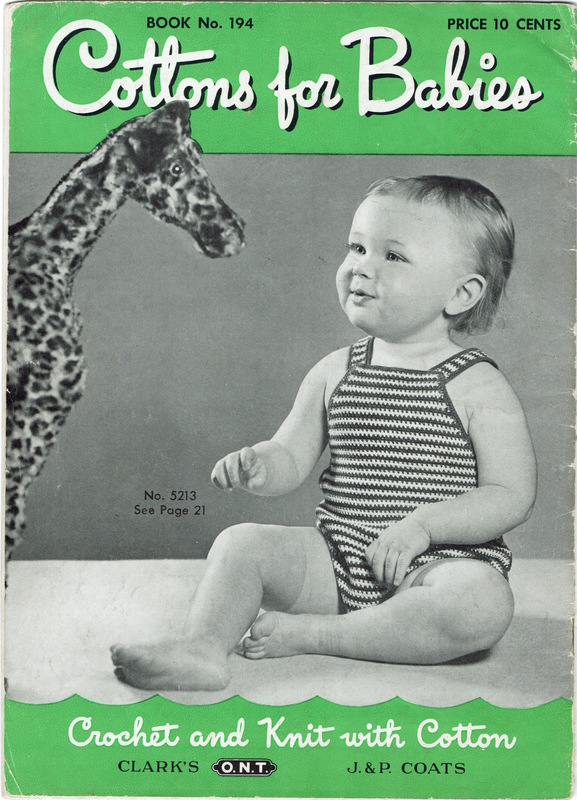 I dug this out of my collection of vintage pattern booklets when I wanted a pattern for baby and toddler socks and wasn’t sure about sizes and the number of stitches I would need. 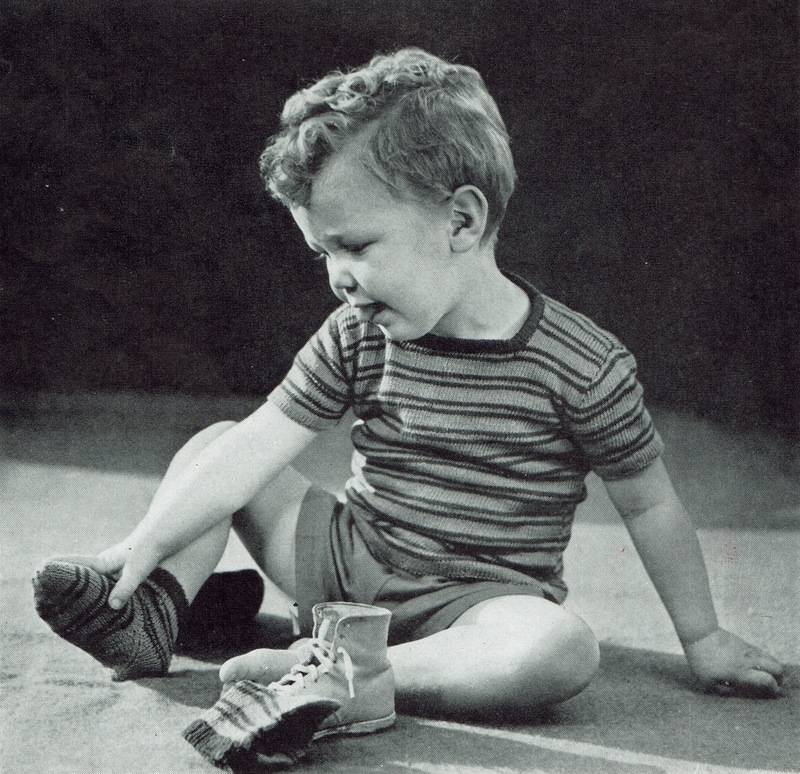 Previous internet browsing had uncovered quite a range and previous experience of little ones had left me with the feeling that though they may be generally little, they can have what seem like disproportionately big feet. The booklet contains this combo of Basque Shirt and Socks, which looked promising. As I read through the pattern I saw that the socks used a forethought (placing waste yarn) afterthought heel and therein lay my surprise. Most of my early knitting patterns for socks are military or service patterns and have what I think of as a traditional heel flap and gusset. Indeed a lot of my older knitting books have this type of construction. I had always assumed that afterthought heels were a newer development, but no, seemingly not. Anyway, I thought I’d give the pattern a go. I love that it’s written for a set of four needles with stitch counts for the sts on each of 3 needles and then working those stitches with the fourth – when did sock needles start coming in fives and stitches getting distributed over 4 needles? I literally can’t get to grips with that so always work with four needles as my grandmother taught me. The instructions will be immediately familiar to anyone who’s worked an afterthought heel before – you basically knit to the appropriate length, ‘then with a different coloured thread (for heel marker) knit across the first needle. Drop different colour thread, go back and pick up light colour and, starting with 1st needle, k around’. 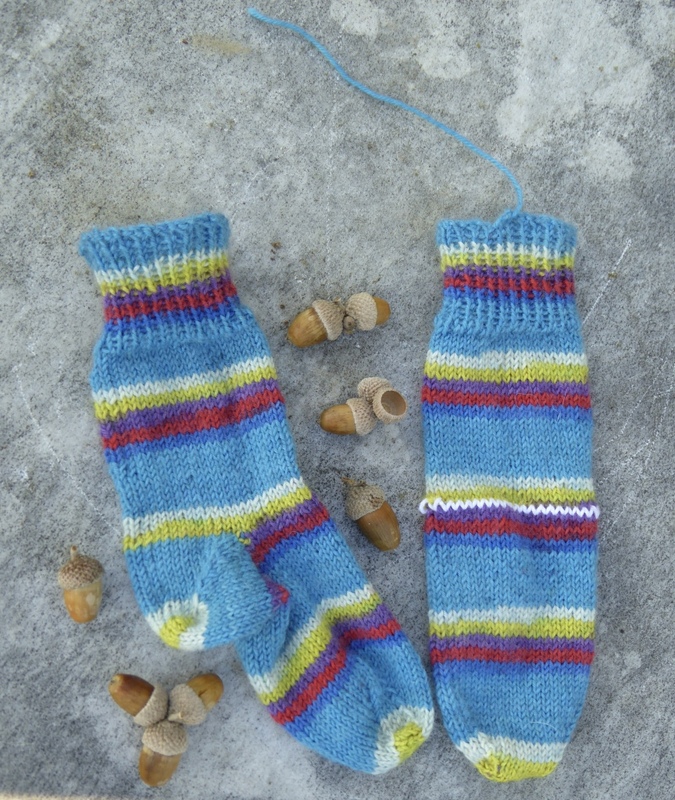 The reference to the ‘light’ colour is simply the pattern keeping the knitter on track for the stripes in these socks. As you can see, I didn’t worry about the striping as I used a self striping yarn. Here’s one completed sock with its afterthought heel, and the second waiting with the waste thread ready to be unzipped. The instructions for working the heel, unzipping, picking up extra stitches at the sides etc are all really clear too and ensure no holes. 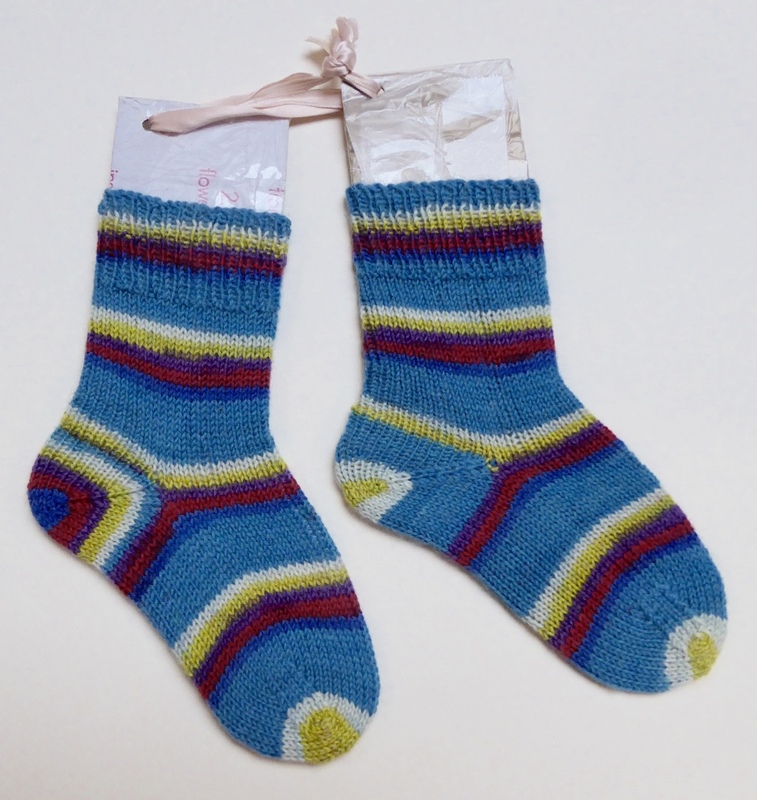 Here are the two socks completed and blocked on some ersatz blockers – i.e. cardboard and plastic bags. These are the socks that sparked the idea of knitting 7 pairs for my great nephew for christmas which I posted about on Friday. I varied things a bit in subsequent pairs swapping the 1 x 1 rib for 2 x 2 rib, ribbing throughout on one pair, shifting the decrease one stitch in when doing the heel decreases, but essentially it’s the same pattern and certainly the same construction. I even stuck to the top down for these when I much prefer toe up for my own socks. I’d be interested if anyone has a sock pattern with an afterthought heel that pre-dates this one, or perhaps are contemporaneous and worked into something a little more sophisticated or substantial than a child’s sock.